Outlook project management, time reporting and more. TrackerSuite.Net provides 100% Web based applications for Project & IT Management, Time and Billing, Purchasing and more. These applications integrate with Outlook, allowing users to surface TrackerSuite.Net within their email client. Users can synchronize tasks with Outlook, drag-and-drop emails to a folder to create tasks, documents, and support tickets, and more. Learn more about TrackerSuite.Net products. Store key information, including tasks, status reports, team members and more in comprehensive project management folders in Microsoft Outlook. Store and access all of your project files and documents right from your email client. Track and review project progress with reports including Gantt Charts in Outlook. 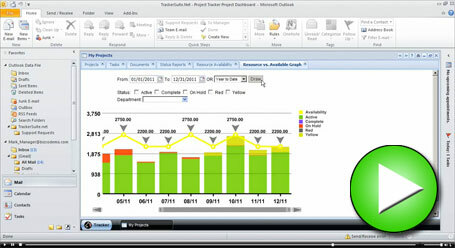 Transform Outlook into your project time and expense reporting tool. Using Outlook based timesheets and expense reports, teams can easily charge their time against their assigned project tasks. Automated routing through email simplifies management and streamlines procedures for project timesheets and expense reports, while securing the process with electronic signatures. Easily generate customer invoices for projects from accrued time and expenses reported in Time Tracker and Expense Tracker. Access customer files in Outlook to review project contracts and billing arrangements. Leverage a powerful reporting engine that receives data from the other TrackerOffice modules, and compiles it into meaningful business intelligence reports including Budget vs. Actual reports, Project Time Pies, Activity Ledgers and more, that can be surfaced in Microsoft Outlook. Transform Outlook into a resource database to simplify personnel management and review, as well as manage resources for projects. Scalability: TrackerOffice easily scales with the project management needs of the organization, whether it is a team of 25 employees or a division of 500. Zero Impact on the Desktop: TrackerOffice is 100% server based and deploys rapidly. Setting up TrackerOffice on every desktop in the organization is as simple as sending an email in Outlook. Lower Total Cost of Ownership: TrackerOffice is competitively priced, and in combination with its rapid deployment and user adoption, offers a swift ROI for organizations. Convenience: TrackerOffice modules offer all the tools your organization needs to operate effectively in a single system: Project Management, Time, Expense, Purchasing, HR, CRM and Business Intelligence reporting. TrackerSuite.Net is a Cloud based solution that integrates with email systems, including Outlook. Watch our TrackerSuite.Net presentations to see how TrackerSuite.Net modules simplify Project Management, Time, Support Services, Purchasing and more. Automation Centre serves customers in a variety of industries including Manufacturing, Professional Services, Financial, Insurance, Utilities, Energy and others. Our customers are seeking solutions for Project and IT Management, Time and Billing, Purchasing, CRM and Human Resources that empower both users and organizations.